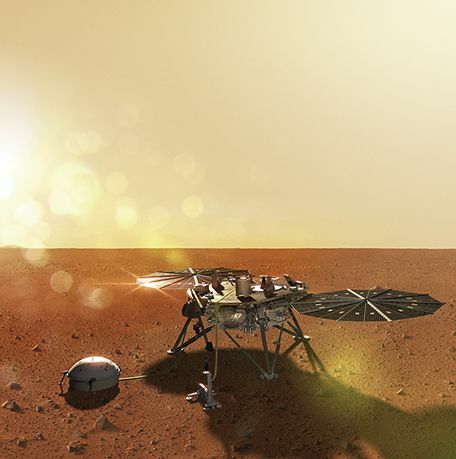 REDMOND, WA (MPG) – Using sophisticated propulsion devices provided by Aerojet Rocketdyne, NASA’s Mars InSight lander successfully touched down on the surface of the red planet Nov. 26. The final phase of lnSight’s descent was powered by 12 Aerojet Rocketdyne MR-107N 50 lbf engines, providing variable pounds of pulsed thrust throughout its descent, which began firing after the lander jettisoned its parachute and heat shield. The engines maneuvered the craft clear of the falling parachute before bringing it gently to the Martian surface, where it will gather data on the planet’s seismology, rotation and internal temperature. Mars InSight began its journey May 5 with its launch from Vandenberg Air Force Base, California, aboard a United Launch Alliance Atlas V rocket. Aerojet Rocketdyne supplied the RL10C-1 main engine and 12 MR-106 reaction control thrusters for the rocket’s Centaur upper stage, as well as helium pressurization tanks for the vehicle’s first and second stages. During InSight’s roughly six-month cruise to Mars, four Aerojet Rocketdyne MR-106B thrusters, each generating four pounds of thrust, kept the probe on target via five trajectory correction maneuvers. Meanwhile, four MR-111C thrusters, each generating one pound of thrust, kept the craft stable and pointed in the right direction. These same thrusters provided the final trajectory and pointing adjustments as the lander approached the Martian atmosphere. Aerojet Rocketdyne also supplied two helium pressurization tanks on the lander. Mars InSight will study the deep interior of Mars, examining in depth its crust, mantle, and core. Aerojet Rocketdyne engines have flown aboard every successful U.S. Mars mission, including orbiters and landers. Additionally, Aerojet Rocketdyne propulsion systems have taken NASA probes to every planet in the solar system and even beyond. The agency’s two Voyager probes, which launched in 1977, are equipped with Aerojet Rocketdyne thrusters. Voyager 1 is in interstellar space, while Voyager 2 is in the heliosheath, the outermost layer of the heliosphere.